Bob Lefsetz’s rant on poor ol’ Steve Boone hit my in box today. Bob’s a prolific ranter. His Lefsetz Letter and email newsletter are usually pretty good, rambly rants on things happening in music and culture. Man, did the bass player Steve Boone have a bad streak of bad luck that he brought upon his own bad self. (Insert bass player joke here.) Boone’s got a new book out that sounds like a How Not to Do It manual, which prompted Bob’s post. 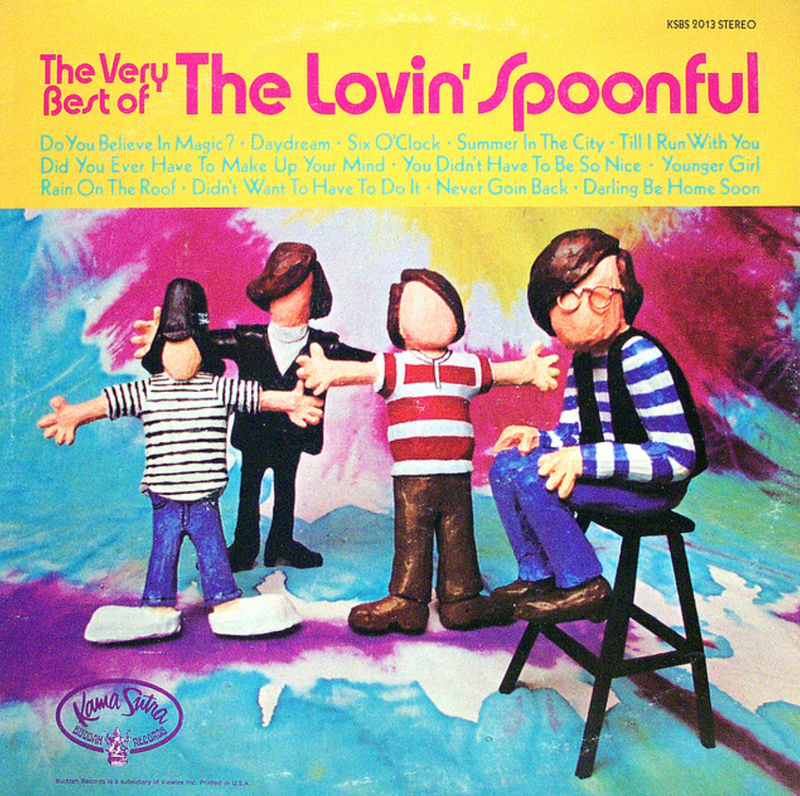 But just seeing the name The Lovin’ Spoonful; wow. It sparked a great big ol’ bucketful of cool memories, despite learning about Boone’s nasty boondoggles. We had The Very Best of the Lovin’ Spoonful, which came out in 1970. I played the heck out of it. There was always great music being played in our house around that time, which was one of the many perks of being youngest of five kids in our house. Thankfully, the other four had great musical taste. But the thing that did it for me with that album was the vibe. It was so 1960’s, and peace, and love, and all that rainbow sunshine stuff. Yeah, there’s some meloncholy in there, but on an impressionable kid, the songs on this album were gold. They sing about magic, and summer, and niceness, whistling about daydreams, and girls. The album cover featured faceless clay figureines of the band. Summer in the City has jackhammer sound effects. C’mon! Some of the tunes are kid-candy, like Nashville Cats, and Summer in the City. Daydream. And Darlin’ Be Home Soon is just beautiful. Even a little chubby Wisconsin kid could see that. John Sebastian’s voice always hit my smile button. Zal Yanovsky – what a name – was a guitarist, and had been in a band with people who went on to form The Mama’s and the Papa’s. These were some groovy people, man. Six years later, Welcome Back, Kotter became a hit TV show, with Sebastian’s theme song hitting number 1. I think it’s one of the top TV theme songs ever. And this album is one of the top summer albums ever. Since summer’ll be fading fast, here’s a taste of a summer spoonful.